Azek is the decking material of choice. The Bowles Group recently finished up a second level Azek deck. There are many different decking materials to chose from. Most of our clients are deciding to build their deck using Azek decking material. Like many Wisconsin residence, this Grafton family wanted to extended their living space outdoors. Nice days are numbered in the Milwaukee, WI area so why not make the best of them on a amazing deck. Before we started this deck building project, the homeowners were very concerned about the possible drawbacks of Azek decking. Don’t confuse Azek decks with regular composite decks! Composite decking was the first synthetic deck material introduced to the market. So many people have been calling all synthetic decks by the “composite” name. However, Azek decking does not contain any composite material at all. Azek decking is made completely of PVC, which is much more durable than composite decking. There are many problems with composite decks that Azek decks simply do not have. Many homeowners have spent thousands of dollars on composite decks that were supposed to wear well and require very little maintenance over the course of its life. Unfortunately, that hasn’t been the case for many composite deck homeowners. Instead these composite decks are stained, faded, and scratched after only a few years. Although no synthetic decking is perfect, Azek decks are much more durable compared to any composite deck. So don’t be scared away from Azek decking because you have heard horror stories of composite decking. The only downfall of an Azek deck is that it does come with a much more costly pricetag. 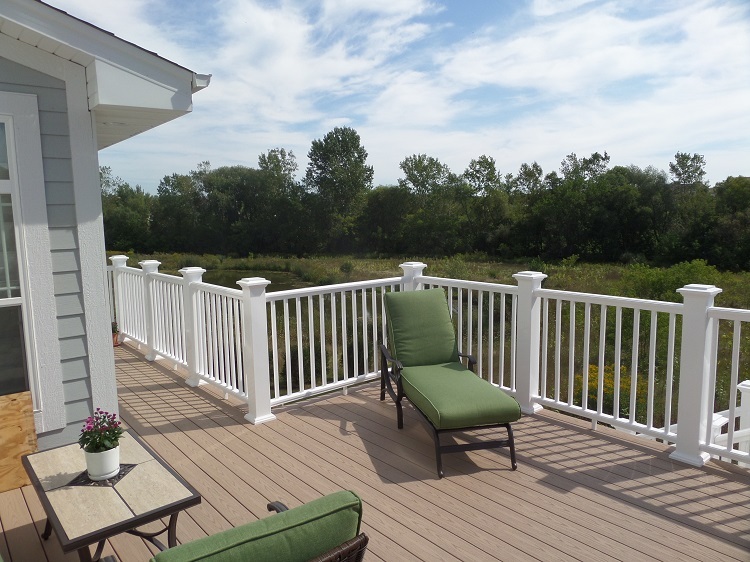 We built this deck in Grafton, wi using Azek’s Premier Line handrail in white. Building your deck handrails in white is almost always the best color option in my opinion. I like the contract in color from the brownstone deckboards. Notice that we also did the deck facia boards and stair riser boards in white. Learn more about your deck options and compare the best decking material.